2-5-2008 spiritual warfare Part 1 part 2 commentary 4 doubting the love and action of the executive elders at Mars Hill was "a demonic lie"
Now while Wenatchee The Hatchet plans to present a fairly thorough transcript of the most salient teachings from the February 5, 2008 spiritual warfare series this is not likely to be a comprehensive transcript of the seminar. That said, we can certainly try to do the best that mere mortals can do. Now, we get to the most explicit condemnation of opposition to or doubts about the Mars Hill executive elders circa 2007. Here was where it couldn't be more explicit, anyone within Mars Hill doubting the degree to which executive leadership at Mars Hill Church loved the church and its people was dismissed and rejected as a demonic lie. Driscoll regaled the leaders of Mars Hill who were his audience about how he alone did counseling up to the point that Mars Hill had 800 people. We've discussed the potential negative significance of that counseling elsewhere. That Driscoll considered doubt about the love and ethics of the executive leadership of Mars Hill a demonic lie suggests the most explicit and direct beginning of what Steve Tompkins described as the "ad hominem" narrative in the history of Mars Hill. One of the problems at the time was there was, to put it nicely, some doubt among members as to how reliable this narrative from Mark Driscoll was on the subject of the re-org. Since a number of men who were around Mars Hill in 2007 and participants in that controversial period of Mars Hill have changed their minds on the rightness of what happened ... it does seem reasonable to wonder. What if the story Driscoll shared in 2007 was ... open to alternate interpretations? To make matters worse, this former elder’s comments came after my more than one-hour lecture in that meeting based on a twenty-three-page document I gave the elders as a summary report about what I had learned from the other pastors I had met with in addition to months of researching Christian movements. I had just explained the cause of the pains we were experiencing as a leadership team as largely tied to our growing number of elders and campuses, as well as ways that my research indicated men commonly respond by sinfully seeking power, money, preference, control, and information as ways to exercise pride and fight for their interests over the interests of the team, church, and mission of Jesus Christ. The elder who sinned was followed up with following the meeting by a rebuke from a fellow Executive Elder, but repentance was not forthcoming. To make matters worse, some vocal church members ran to that elder’s defense without knowing the facts, made demands upon the elders, acted in a manner that was not unifying or helpful, and even took their grievances public on the Ask Anything comment portion of our main website for my forthcoming preaching series. Of course, this was done under anonymous names to protect their image in the eyes of fellow church members while maligning the elders publicly. Some church members even began accusing the other elders of grabbing power and not caring for the best interests of our people, which is nothing short of a lie and contradictory in every way to the entire process we were undertaking. It broke my heart personally when amidst all of this, a member asked me on behalf of other members if the elders really loved our people. Now having given roughly half my life to planning for and leading Mars Hill Church, the questioning of my love and the love of our elders, some of whom even got saved in our church, for our people was devastating. In the wake of what Mark Driscoll would call a "difficult season" amidst controversy and doubt about whether the executive elders were truly sharing power or consolidating power by shrinking the minimum required number of officers and executives while expanding their powers at the end of 2007, Mark Driscoll in February 2008 declared that the idea that the executive elders might act in ways that were from anything but love for Mars Hill was "a demonic lie". Bear in mind that by this time the bylaws had been revised by either Jamie Munson or Mark Driscoll in such a way that all Mars Hill staff were at will employees who could be fired at any time by two guys, or so it seemed. Add on top of this the explicit condemnation of doubts about the character and views of the executive elders as being satanic and it looks like the Spiritual Warfare teaching Mark Driscoll gave in February 2008 should not be seen as some controversial seminar on spiritual warfare, or not just that. It begins to look more and more as though it should look like a blunt instrument rhetorical session in which Mark Driscoll seemed to make it clear that any doubting of the executive elders might as well be considered satanic. If Tompkins was at this sprawling teaching seminar then it's little wonder why he and others might have taken this incendiary condemnation from Driscoll about doubting the executive eldership as a sign to shut up and say nothing. Well ... having gotten through just the first thirty-four minutes of part 1 that might be enough for the weekend. Maybe. Those who believe Mark Driscoll may have some sin issues but that he's not disqualified from future pastoral ministry are open to reaching that conclusion if they absolutely insist, but Wenatchee The Hatchet (who has had the spiritual warfare series sitting around since at least 2008) would suggest that there is still more evidence to consider. This spiritual warfare series wasn't for congregants or members, it was a leaders-only session and as such it may be one of the more informative and important behind-the-scenes snapshots of how Driscoll might have talked when he was confident he was in a leaders-of-Mars-Hill-only setting. What the hell did the Board of Overseers think they were really saying when they wrote this? But if spiritual pride is satanic and arrogance is satanic ... then hasn't Mark Driscoll's own teaching about spiritual warfare circa 2008 managed to paradoxically count as a ground for Driscoll's own disqualification for pastoral ministry? Driscoll can say he's repented of arrogance as much as he wants, he needs to account for why his arrogance and pride are things to repent of but also something that isn't sufficiently satanic (in his case alone) to disqualify him from pastoral ministry. If the Board of Overseers decides that arrogance isn't a satanic quality they they have to either find themselves rebuked by the teaching of Mark Driscoll on the one hand and consider him wrong or, on the other hand, to consider the possibility that Driscoll's own teaching about arrogance as satanic testifies against his own future fitness for ministry if he doesn't repent (at best). But wait, there's actually still more. We're only just getting to about 34:00 through Part 1 of Spiritul Warfare from 2008. We're only halfway through part 1 of a three-parter with a Q&A session. We haven't even touched "I see things" or gotten back to the "ordinary demonic". But time permitting we'll get to those. However, for the moment we need to proceed to the next part where Mark Driscoll talked about a "myth" and a "demonic" lie that specifically dealt with the history of Mars Hill and may have been a reaction to some sentiments in Mars Hill in early 2008 that might have had some roots in the previous year. ... you're not to grow up and be proud, to rise up in arrogance, saying: "I understand Satan and demons, and I know how to defeat them." That is absolutely demonic in and of itself. The power is Jesus. Right, because that might inspire someone to spend more than three hours explaining to other pastors and staff at Mars Hill how to approach spiritual warfare? But this, too, is a stepping stone to a more significant statement. Satan may be bugging Billy Graham, but if he's gonna pick one person it's probably not gonna be you or me, right? He's got more important people to attack. Now you and I could have demonic opposition, to be sure, but Satan and demons are not omnipresent. They're not everywhere. So on the one hand Satan wouldn't be wasting time with anyone at all at Mars Hill, including Mark Driscoll but it has been popular among some advocates for Mars Hill and Mark Driscoll to propose that recent events are nothing but the work of Satan over against Mark Driscoll's explicit repudiation of such a thing being possible in 2008. Of course paradoxically what the right hand took away the left hand spent quite a bit of time giving back. Incredibly that's not all there is to be said about this section because now we're finally ready to get to what Steve Tompkins described this week as an "ad hominem" narrative. First we have to get to the overview of all the falsities Driscoll warned about. Starting about half-way through minute 26 Driscoll began to explain how there were false prophets, false apostles, false teachers, false leaders and false Christians. Also working with Satan and demons are false apostles. They'll pioneer new ministries, they'll pioneer new churches, they'll pioneer new religions. That's why in the book of Revelation Jesus says that there are some churches that are really synagogues of Satan, that they look like churches but really Satan is the one who is in charge and false apostles and false prophets are ruling there. That may be true but since the leaders who have resigned and bailed on Mars Hill Church in the last three months have been none other than Sutton Turner and Mark Driscoll himself isn't it pertinent to suggest at least the possibility that by the measure of a false leader as defined by Mark Driscoll in the 2008 spiritual warfare series that Mark may have tragically become one of those sorts of people who "went out from us but they really weren't of us"? After all, if Driscoll loved Mars Hill so much why leave? The safety of family? Well, fair enough ... and yet when talking to and about so many other people Driscoll has stayed with "fear of man is deadly". And let us consider another way in which the paradox of Epimenides could apply here. Driscoll refers to false prophets who have supernatural abilities ("I see things", anyone?) but has identified himself at times as a prophet and an apostle. So how did Driscoll manage to avoid putting himself in a potential bind where HE could be identified as a false apostle and false prophet? After all "I see things" in itself is not insurance against being a false prophet, is it? Driscoll may have paradoxically outed himself as a potential false prophet/false apostle by invoking supernatural power (discernment" in the session. After all, "A gift of discernment kinda comes to the fore for me." seems to make it clear Mark was willing to tell leaders within Mars Hill he had discernment. But in Driscoll's session he introduces to the leaders that the great threats to the health and safety of Mars Hill were from the inside. Driscoll went so far as to say that a real problem in Mars Hill up to 2008 was that basically the pastors were too nice to people. ... A good shepherd is not just one who gives mercy to everyone. `Kay, this has been, this has been a real problem at Mars Hill, that some of you who are shepherding (this will be my fatherly rebuke) you're cowards and you're hurting. You're hurting the church because you, in an effort to be really, really nice, want to shepherd everyone. Well, you don't shepherd a wolf. You don't shepherd a wolf. Part of shepherding is the ability to distinguish between wolves and goats and sheep. Sheep need to be brought to repentance, cared for, helped, loved, served. Goats need to be rebuked and not given the illusion that they're sheep. And wolves need to get shot. Right? So for people who would think that behind closed doors Driscoll would rip even more on gays, not quite. But what he did do was say that the most dangerous person is someone rolls into a church and isn't interested in submitting to spiritual authority ... and yet Driscoll famously said of himself he started his own church because he didn't like any of the other churches in his city enough to join them. Not even Antioch Bible Church, which sent him out? Apparently ... .
Humility is the mark of Jesus and faithful Christians according to texts like Philippians 2. The He humbled himself and we are to humble ourselves, that God OPPOSES the proud and gives grace to the humble is what Peter and James say. And Satan's real issue is pride and he loves to get people filled with pride because it then enables that, him, to incite them to join in his rebellion. One thing I will say in this as well is as we get into the issue of Satan and demons is that, even as you have knowledge of Satan and demons, even as you have the pastoral capacity to help people who are struggling with Satan and demons, you still need to be very, very careful to maintain a posture of humility. Sometimes demonic and deliverance ministry is so rife with pride and declarations and "Satan, I command you to do this and I command you to do that." and it just, it just reeks of pride. Jesus says, I think it's in Luke's gospel, "Do not rejoice that the spirits are subject to your name." Don't rejoice that you have authority over Satan and demons. Rejoice that your names are written in heaven. That humility, that God loves you, that God cares for you, that Jesus is your savior and you get to use the delegated authority of the Lord Jesus in spiritual encounters and conflicts but, at the end of the day, you're not to grow up and be proud, to rise up in arrogance, saying: "I understand Satan and demons, and I know how to defeat them." That is absolutely demonic in and of itself. [emphasis added] The power is Jesus. We'll get to the bolded segments in time. However ... let's first get to the "red letter" statement, because it involves a fairly easily contested claim about historic Christian teaching and interpretation in the West. So, no, Mark is misrepresenting the history of interpretation and debate about Satan and demons by associating Ezekiel and Isaiah with some hot debate. Only a group of guys with no serious theological, historical and textual education (which, to be fair, may well have been the case for many in one of the least-churched regions of the United States) should have been able to go along with Driscoll's song and dance on this particular point. One of the easily overlooked but not-very-subtle problems with Driscoll invoking the traditional and largely uncontested Christian gloss of Satan on to Ezekiel and Isaiah oracles against long-dead kings is that to do this Driscoll has to accept an apocalyptic/typological hermeneutic that he rejects in the case of Song of Songs (with a slurry of gay panic jokes involving Jesus) and this in spite of the fact that if he insisted on as comparably a literal hermeneutic for the famous prophetic oracles he'd have to REJECT them as having any application to Satan. That got discussed at some length over here. So Driscoll not only misrepresented some fairly basic and easily-established facts about not just evangelical interpretation of oracles interpreted as applying to Satan but also of oracles whose relevance to Satan has largely been taken as given through the entire history of Western Christianity since at least the medieval period. Anyone who wants to disbelieve in Satan and demons really hasn't paid careful attention in their reading of the gospels. Satan comes to Jesus. People who are demonized come to Jesus. Jesus interacts with, speaks with, casts out demons. He just does and this isn't something He does once or twice, it's not continual, but it is fairly frequent if you read the gospels. The point there is this is a normative part of Christian life for those who love God, as Jesus did. The source of Satan's fall, as well as demons, is pride. Everything I'm gonna share with you is highly debated but in texts like Ezekiel 28, Isaiah 14, it seems to say that: Satan was an angel, he was a spiritual being, and that he became proud in his heart and he sinned against God, he didn't want to worship God he wanted to be worshipped as God, he didn't want to serve God he wanted to be served as God, and in so doing pride is really the source of all that is demonic. I mean think about that. If pride is the source of all that is demonic (Augustine, the church father, said that pride is the mother of all sin, it's pregnant with all of the other sins) then Satan has done a great work because we believe in this day that self-esteem is a great virtue and not a vice and that pride is a good thing and not a bad thing. I've said it before but even in the canon of western literature there are men like Bill Bennett who wrote the Book of Virtues and it includes all of the great virtuous stories in the Western canon of literature, and the one virtue that's not included is humility because in the Western canon of literature humility is a vice, not a virtue. Pride is a virtue. I mean think about that. If pride is a foothold for Satan, if pride is the mindset of Satan, then our culture is absolutely infiltrated with a demonic value system of pride. Of pride. One thing I will say in this as well is as we get into the issue of Satan and demons is that, even as you have knowledge of Satan and demons, even as you have the pastoral capacity to help people who are struggling with Satan and demons, you still need to be very, very careful to maintain a posture of humility. Sometimes demonic and deliverance ministry is so rife with pride and declarations and "Satan, I command you to do this and I command you to do that." and it just, it just reeks of pride. Jesus says, I think it's in Luke's gospel, "Do not rejoice that the spirits are subject to your name." Don't rejoice that you have authority over Satan and demons. Rejoice that your names are written in heaven. That humility, that God loves you, that God cares for you, that Jesus is your savior and you get to use the delegated authority of the Lord Jesus in spiritual encounters and conflicts but, at the end of the day, you're not to grow up and be proud, to rise up in arrogance, saying: "I understand Satan and demons, and I know how to defeat them." That is absolutely demonic in and of itself. The power is Jesus. 25:40 explains that Revelation says the number of demons is set and limited though they are alive and active and well. ... False prophets include false preachers. They lead cults, they lead false religions, they promulgate false doctrine. There are false prophets, people who have supernatural ability and power, people who (when they speak) things happen--people follow them, they're very powerful. There are also false Christians (Galatians 2:4 speaks of)--false Christians really don't love Jesus, really don't belong to Him but they come into a church with the desire (demonically inspired desire) to absolutely destroy. 1 John speaks of this saying some people who were in the church, "They went out from us but they really weren't of us. If they were of us their either would have stayed with us or returned to us." meaning, there are people in the church that, just like Judas getting into the inner circle of the twelve disciples, and then being filled with Satan and inspired to destroy Jesus, there are false Christians who get into churches and they are just divisive, the promulgate false doctrine, they tell lies, they confuse people, right? Because in the church there's sheep and goats, shepherds and wolves. And Jesus, according to 1 Peter 5 is chief shepherd. A good shepherd is not just one who gives mercy to everyone. `Kay, this has been, this has been a real problem at Mars Hill, that some of you who are shepherding (this will be my fatherly rebuke) you're cowards and you're hurting. You're hurting the church because you, in an effort to be really, really nice, want to shepherd everyone. Well, you don't shepherd a wolf. You don't shepherd a wolf. Part of shepherding is the ability to distinguish between wolves and goats and sheep. Sheep need to be brought to repentance, cared for, helped, loved, served. Goats need to be rebuked and not given the illusion that they're sheep. And wolves need to get shot. Right? The whole analogy of wolves, it comes up out of Acts 20 where Paul says in his farewell address to the Ephesians elders: "When I leave (and he's prophesying here). When I leave men will arise from your own number, distort the truth, and lead many astray." The greatest threat to the health of any church, including Mars Hill Church, is wolves in the flock. Right? It's not the dark city and the atheists and the homosexuals and the abortion doctors. We want them all to meet Jesus and come to repentance. But the truth is, in a church like Mars Hill, if someone says, "I hate Jesus," they're not going to get a big following of our people. It's the person who comes in and says: "I love Jesus but I don't submit to spiritual authority, I don't submit to sound doctrine. Listen to me, not to them. I have my own issue, my own agenda, seeking my own ministry, my own cause, my own fame, my own glory, my own power." Just read various manifestations of spiritual pride, which is demonic, and then people are confused by that because wolves love to eat sheep. Paul says they will distort the truth and lead people astray. They'll plant their own church, start their own ministry, begin their own doctrinal instruction, whatever it may be. When the church was small, I was able to shoot wolves. I cannot tell you the hundreds of hours that I have had just going at it with somebody who was a wolf and just telling `em: "look, you've gotta go. You are not welcome here. You're a false teacher, you're a false prophet, you're a false apostle, you're a false leader. You keep nominating yourself to have power. We don't see you the humility, and the character, and the doctrine that the scriptures require." And as the church gets bigger and as it spreads you have to guard the gate. I can't do it. I can't do it. I can't keep track of all of the campuses and all of the heretics and all of the false teachers and all of the false leaders and all of the people that Satan is sending in to distort the truth and lead many astray and to be as wolves among the flock. For those of you who are shepherds at this church you have to guard the gate and it can't be, "I give mercy to everyone who comes." Because if it's a wolf feeding the wolf only allows them to be stronger so that they can devour more sheep. You're goal is not just to be nice to people and to care for them. You're job is to be discerning and to ask yourself, "Goat or sheep? Wolf ... or shepherd?" It takes discernment. It takes a tremendous amount of discernment and the longer you make an erroneous evaluation of someone the more influence they have, the louder their voice, the deeper their following, and the more painful, the more painful it will be to deal with them. `Kay? One of the simplest and most salient observations to make about Mark Driscoll's story of pre-conversion encounters with what he considered the demonic is that he presents a story in which encounters with demons recur through his life, at least up through the 2008 presentation. There were just a few isolated incidents here and there before his conversion experience. Now the story about being in the car with Grace and the black hoodie-wearing guy sounds like a story that perhaps the Driscolls could be asked about because amid the entire narrative there's a simple question that would need to get addressed about how someone could be driving 30 miles an hour and still come across the same person multiple times. Was Mark Driscoll driving in circles? If so then it's hardly a surprise at all that he and Grace would see the same guy walking. If the claim was that the automobile was being driven in a straight line and then somehow the hoodied guy kept showing up it's still not clear why anyone should be entirely sure that this account could be described or taken at face value as a "demonic" encounter. Mark has said he's been in love with Grace for some time now and perhaps moon-eyed young lovebirds don't pay attention to the road. To borrow an old Driscollism from the early years of Mars Hill, are we sure this is really a spiritual encounter or was it maybe some bad pizza? But assuming Mark and Grace Driscoll did have brushes with demonic experiences there's time to get to a possible explanation for that within the Driscollian taxonomy of spiritual warfare later. Mark Driscoll's account seems to generally cover the idea that before he was a Christian he had a few unexplainable encounters and then he became a Christian and married Grace and then things really exploded into weirdness. If the story so far is that there was an escalation of spiritual attacks of some kind this needs to be borne in mind because in this presentation (which WtH hopes to discuss further) this sets the stage in early 2008 for a ministry culture in which stories of satanic/demonic opposition as just part of the job and that it flourishes WITHIN CHURCH LIFE are taken as given. Of particular importance may be Mark Driscoll's self-description during this period, "A gift of discernment kinda comes to the fore for me." It's in this segment of the presentation we see the first points of "I see things" and about being able to read people's proverbial mail. Now while a cessationist might default to a possible explanation that any claims to super-powers would be a sign of possible demonic activity within Mark Driscoll let's forego that consideration for the time being. Instead, let's consider that Mark Driscoll got a degree in speech communications about which we know relatively little. Let's put it another way, if we invite some more secular interpretive approaches here what if Mark Driscoll just happens to be a better than average cold reader in a church setting? Wenatchee The Hatchet suggests that when Steve Tompkins alluded to a cultural narrative within Mars Hill leadership that presupposes an ad hominem narrative in response to both internal and external critique the February 5, 2008 spiritual warfare series looks like a possible starting point for getting a clear sense of how such a narrative could have been both explicitly and implicitly established, which Wenatchee The Hatchet may be able to publish and discuss a bit more over the weekend. Back in February 5, 2008 Mark Driscoll did a lengthy teaching event on spiritual warfare as a presentation scheduled by the Mars Hill biblical living department that was for leaders within the church. This was not material that was presented from the pulpit in a Sunday setting and so it should not be construed as what Mark Driscoll made publicly known from the pulpit (his broaching the subject of spiritual warfare and demons from the pulpit withstanding). Instead this series should be considered a more insider, leaders-only instruction and with that in mind we will take some time to look at the teaching not necessarily as a purely doctrinal presentation or even necessarily as a practical exposition on spiritual warfare or counseling within Mars Hill (though that could and probably should be done). Rather, what we'll take some time to do is to look at the narrative presented in this series and consider some general statements made by Driscoll in 2008 with an eye toward assessing the potential significance they may have for other narratives Mark Driscoll presented about his own history and the history of Mars Hill Church. This will largely be a select transcript of audio that is for the moment still available. I'll start with my story. Growing up I didn't know Jesus, not until I was 19 years of age. I did, however, have a lot of demonic--I shouldn't say a lot--I had a few demonic encounters, experiences, that I didn't really know what to do with, to be honest with you. One of them was in a friend's house where a religious leader had lived and committed suicide. Their, one of their parents was really into the occult, into witchcraft and was actually very devoted to the study of religions, and the black magic and black arts. The result was I was coming down the stairwell in their home on one occasion and actually was physically stopped. I couldn't go down the stairwell. I was a teenager and I didn't know what was going on. It was very disorienting. I didn't do drugs. I didn't do alcohol. I wasn't in any altered state of consciousness and I literally grabbed the handrail going down the stairs and I pulled myself to the point that I was about a parallel angle with the stairs and I felt pressure on my chest that something was literally holding me up and I couldn't go down the stairs. It was just very bizzare. I went back upstairs for awhile and eventually I DID go back down the stairs. Just some very strange, supernatural, paranormal things that I couldn't really understand. When Gracie and I were dating, we were out driving in, I think I was driving her car. We were, again, in our teens, we were stopped when someone walked by us, just this large, ominous figure. Very bizzare-looking guy with a black hoodie on and just kinda creeped me out and creeped Grace out. And we drove by him and he was walking and we were going thirty miles an hour. A few blocks later we hadn't stopped or anything, we passed the guy again. What in the world? She was a pastor's daughter and WAS a Christian. And she was very scared and it was very unusual, it was late at night. And a little while later we went to take a turn to go to her house and the guy was in front of us, literally. This was a guy now we passed three times. He was walking over the course of many blocks. We're going thirty miles an hour. He's never stopped. And we never stopped but there's no way in the world he should be able to keep up with us. It was just one of these bizzare occurences. He literally stepped out into the road in front of us to stop us. And I freaked out. I hit the gas. I was gonna run the guy over. True story. So I go right at this guy and he disappears and he bangs on my window. I have no idea. I can only explain it as non-physical. Grace and I panicked and drove off but in these occurences my body would respond. My hair would stand on end, I really freaked out, I didn't know what was going on because I didn't understand. Just some bizarre, supernatural things like that that didn't make a lot of sense to me. Just odd experiences and then when I got saved, became a Christian, I had a few, I would say, demonic encounters. And then Grace and I got married and things REALLY stepped up when we started Mars Hill Church, to be honest with you. I was basically taught by some dispensational pastors, not in college, but following graduation that Satan and demons worked in the early church but not today. I thought, "Well that's good." Went to plant Mars Hill Church and the next thing I know bizzare things are happening. REALLY bizzare things are happening. We had one service where, in the middle of the service, some guy stood up and started speaking in the first person, "I am not happy. This is not what I command." I mean, just a real authoritate voice. [the guy] Got up, came toward the front end of the church. I stood up, just during a prayer time, it was a visitor, first-timer. We don't know who this guy was. And I just opened 1 John and started reading a section about Satan and demons and he literally just screamed and ran right out the center aisle right through the back doors of the church and disappeared. He said, "I am God and you are to worship yourself as god." He was just talking crazy nonsense. Really loud, it freaked everybody out. We were more arty at that time so some people thought this was some, like, arty thing we were doing and once they realized it was a demonized guy it wasn't, wasn't as interesting it was terrifying. So it was Mike Gunn and Lief Moi, two of our pastors, who talked to this guy afterward and we asked his buddy who was with him, "What's up with your friend?" and he said, "I don't know. I've never seen him like that. Totally freaked out during prayer, changed, was prophesy--I don't know who this guy is." Neither of them were Christians. We talked to the guy afterward he, we finally tracked him down he was down the block. He had no idea what had happened. Said, "I don't know what happened. I'm sorry." His buddies tell him, "Dude, you freaked out. You were screaming." ... He was just shocked, "I don't remember any of that." He was back in his sound mind. He wasn't crazy. He just lost it and something took over in him. Had other occasions where then I started getting meetings in the church, some very good people, godly people. One woman who would nurse her children she had a real extreme background in Wicca and witchcraft, and she would hear voices, things would manifest, and she reports that on more than one occasion she'd be feeding her child and her chair would levitate, her rocking chair and she's holding her baby. One woman claimed that ever since she was a little girl she had an angel who would come and comfort her when she was abused as a young girl. She had this guardian angel that would come and talk to her. Well, then she became a Christian and this guardian angel started telling her not to worship Jesus, and stop going to church, and she's like, "What do I do with that? Is that like a real angel?" That doesn't sound like a real angel, that sounds like a demon to me. Had other people with night terrors. I had people seeing things. I had people that are clarivoyant. I had people that are hearing things. I start getting prophetic dreams, God's showing me the future. A gift of discernment kinda comes to the fore for me. Not all the time but I can see somebody and I just know their story. I remember walking up to people and, one woman, telling her: "You know, last night, did your husband grab you by the throat, throw you up against the wall, threaten you, and tell you that if you told me that he would kill you?" She's crying, she said, "How did YOU know?" I said, "I don't know. I see it. I see it, like a film." I started having dreams. I started seeing things. I start reading people's proverbial mail. I did not know what to do with any of this because, in my theology, I'm a cessationist. That means I believe that the supernatural essentially ceased in the early Church so we don't have charismatic gifts today, and the demonic activity isn't real, especially for believers. So I needed to know what to do, so I remembered the pastor and I asked him, I said, "What do I do with all of this?" He said, "That's not for today. That was only in the early church." I said, "Why in the early church?" He said, "Well, you know, there was more demonic opposition and there was more spiritual gifts of the divine, supernatural in the early Church to get it started, to get it going." I said, "Well, I'm planting a church. I'm getting it started. I'm getting it going." It's just as pagan as anything in the New Testament." Seattle is so completely dark and completely unchurched, I said, "How could it not be that the same resistance they had in the planting of the early church that I'm experiencing in the planting of this church?" He said, "Naw, don't worry about it. It's not a big deal, it'll be fine." Well things got worse. I didn't know what to do. I now have people meeting with me fairly often. I was the only full-time pastor on staff at Mars Hill until we had 800 people. I did ALL of the counseling, ALL of the premarital, ALL of the hospital visits, ALL of the weddings, ALL of the shepherding, ALL of the care. And more and more I'm hearing it--we have people coming to Christ out of witchcraft, out of deep occult, out of all kinds of bizarre new spirituality. We have people that have been sexually abused, that have comforting spirits. We have demonic manifestations, I'm starting to have personal things happen that I can't account for. It's not like I WANT to believe in this stuff, it's not like I'm LOOKING for it. It's just there. Met another pastor, really good guy. Did his doctoral dissertation on spiritual warfare and he trained me in a lot of this biblically. He said, "Well, here's what the Bible says, here's what you should do, and here's how you can help people." I trained under him for a few occasions; learned from him some things I'll share with you today; and then hooked up with Dr. Gerry Breshears at Western Seminary down in Portland and did my master's degree, kind of in a tutorial program under him (I'm actually finishing up the last class right now) and we spent a lot of time studying this together. Reading, studying, discussing dialoguing. He's former president of the Evangelical Theological Society and a dear, dear friend of mine now and so I brought my questions to him and we started working through it biblically. And I started reading. Two things I did: I started reading, starting in Genesis and went to Revelation and I read the whole Bible, just pulling out everything in the Bible that dealt with Satan and demons. I just want to know what the BIBLE says. I know some of you guys are, like, researchers and you love software and you do cross references. I'm old school. I just read the whole Bible and highlight the parts that talk about Satan and demons. Took a few months to do that. And then I read all of the books I could find on spiritual warfare. Guys like Bubeck (?) and Unger and Dickeson and Murphy. Uh, Clinton Arnold, C. S. Lewis' book, Randy Alcorn's got a book similar to C. S. Lewis's. I read the Puritans and Thomas Brooks. I read biographies of Martin Luther, who had, as he accounts it, real encounters with Satan. I looked at all the perspectives from the cessationist to the real strong charismatic and just tried to figure out what everyone said. And it was interesting because there was so much conflict and debate around the issue of Satan and demons and even somebody like Merrill Unger (who was, sort of like, a classic Bible teacher of a few generations ago) he wrote a book about how a Christian can't be demonized and this is extremism and then he wrote another book saying, "I was totally wrong. They can be." So even Bible scholars connected to good seminaries like Dallas Seminary were in the throes of their own personal change in thinking on some of these issues. people tormented no longer being tormented. people with demonic manifestations no longer experiencing that kind of thing; I've even seen people physically healed in my office and I praise God, because so much of it was demonic and Satanic that was harming them. So I appreciate the invitation to teach on this subject. I come at it from a very practical, pastoral, biblical perspective. Clinton Arnold is one of those guys who does a great job in studying the New Testament and writing on these issues. He's a great New Testament scholar. I'll leave some of the theological heavy lifting for him and I'll talk real practically and pastorally. The News Tribune quotes Justin Dean, the spin-offs cannot use "Mars Hill"
That means the Tacoma congregation would have to assume its loan or sell the church, a historic building near Wright Park. Justin Dean is quoted as saying whatever the congregations become in 2015 they can't use the Mars Hill name. Church spokesman Justin Dean said congregations won’t continue under the Mars Hill name. Mars Hill expanded to Tacoma in late 2012 when it purchased the historic First Congregational Church for $1.9 million. The sale was concluded and First Congregational was paid. Mars Hill Tacoma has a mortgage with Bank of America. Mars Hill completed a $1 million renovation of the church and started having services in the 107-year-old sanctuary last December. The Rev. Bubba Jennings, lead pastor of Mars Hill Tacoma, did not immediately address questions Friday about the future of Mars Hill Tacoma. An executive pastor that works under Jennings declined comment. Several members of the Tacoma congregation also would not comment Friday. For those who may not remember this, Bubba Jennings was one of the executive elders in place in 2007 when the firings and trials of Bent Meyer and Paul Petry happened. If former EIT member Steve Tompkins has made a point of publicly express regret over and repudiating the ethics of the 2007 process recently, then Bubba might want to decide whether he's going to address that along with the other significant transitions afoot in the realm of Mars Hill. While the official news today is the announced closure of Mars Hill Church the thing to observe for a possible future is that Matt Rogers has already registered a UBI #. But first, we need to review what Matt Rogers has said in the year so far. Rogers described those attending a summer protest at Mars Hill as leaving a bit of trash and slandering good men. This past Sunday outside our building about 60 professing Christians led a protest, left a bit of trash, and slandered good men. Inside the building our church family worshipped Jesus. Let that image be what defines us. Others will cast aspersions, but we will worship Jesus. Where, exactly, are those good men these days? Didn't Sutton Turner and Mark Driscoll both quit? But let's continue observing what Matt Rogers has had to say whether as an individual or as part of a group. So if the Board of Elders was reaching a conclusion that Mark Driscoll had a disqualifying sin issue in his life Matt Rogers was simultaneously on the Board of Overseers as well as on the Board of Elders. What did the Board of Overseers conclude? We found some of the accusations against Pastor Mark to be altogether unfair or untrue. Other charges had been previously been addressed by Pastor Mark, privately and publicly. Indeed, he had publicly confessed and apologized for a number of the charges against him, some of which occurred as long as 14 years ago. So Rogers was part of the BoO that concluded that Driscoll may have sinned but not in a way that disqualified him from ministry and that Driscoll was never charged with any serious stuff and that they were surprised he chose to step down. The investigation of formal charges against Mark Driscoll has revealed patterns of persistent sin in the three areas disclosed in the previous letter by the Board of Overseers. In I Tim 5:20, it requires that an elder be rebuked for persistent sin. Our intention was to do this while providing a plan for his eventual restoration to leadership. The Board of Elders in agreement with the Board of Overseers are grieved, deeply grieved, that any process like that was lost to us when Mark Driscoll resigned in position and left the church. [emphsais added] Now is the time to move on and consider what God is calling us to next as a church as we participate in Jesus’ mission to make disciples in His name. Today begins a new chapter in the history of our church which has proceeded in one direction under one leadership for many years now, but I want you to understand this, God is our Father. That does not change. Jesus is the chief shepherd of the church and that has not changed. At this time Mars Hill Church is going to move ahead under the Board of Overseers established plan for transition. [emphasis added] Pastor Dave Bruskas will serve as the teaching and preaching pastor during an interim period of time until we establish a direction we are going as a church. The Board of Advisors are going to be working in the weeks to come on a plan for moving forward and for how that will unfold, what the next steps are, there are a lot of things to consider. As we discover what those things are, what the spirit shows us, then we want to communicate clearly to you and transparently to you what’s happening, the directions and the changes that will be taking place. Recall that Wenatchee The Hatchet has pointed out the BoAA (of which the BoO is a part) has the power to authorize the dissolution of the corporation and the sale of assets. Go over here for a discussion of the bylaws. It's important to bear in mind that Matt Rogers has a spot on the BoO/BoAA and was also on the BoE. Rogers was on the team that has the power to authorize real estate sales and the dissolution of the corporation so, necessarily, Rogers had some involvement in the two processes that have been news. Rogers was also part of the group that stated Driscoll wasn't unfit for ministry. But in the last week Mars Hill Pastor Steve Tompkins has made public statements expressing regret over the 2007 firings and trials. Tompkins has also made statements that seem to indicate that the Board of Elders as a group did find Mark Driscoll to have disqualifying sins with respect to ministry. So that casts doubt, or should cast doubt, on Matt Rogers' claims that allegations about Driscoll's leadership style could be understood as slander if even he, as a member of the BoO/BoAA signed off on a letter that acknowledged that the sins Driscoll has been accused of are basically probably true--Rogers just didn't seem eager to accept the possibility that the sins were in any ones that disqualified for ministry. So the BoE statement and more recent statements by Tompkins cast doubt on the veracity of the claims made by the BoO. Matt Rogers was the only person who was both on the BoO/BoAA on the one hand and on the BoE on the other. Well, as word gets around, Throckmorton has observed that Matt Rogers has ALREADY REGISTERED Bellevue Church. So as of today, when Bruskas announced that the corporation known as Mars Hill Church is going to be closed, Matt Rogers is already the registered agent for Bellevue Church and its Chairman, with Thomas Hurst, Jason Skelton, and Roger Molvar as directors. Already registered. Matt Rogers was on all the boards and was part of the investigation which may or may not have actually been completed and part of the Board of Overseers deciding what happens to Mars Hill and amidst all that he found the time to register Bellevue Church with the Washington secretary of state, huh? As in, registered it before Bruskas made today's headline-making announcement. There may need to be several spotlights on Rogers these days. If you're the sort to send thank you letters to someone for the dissolution of the corporation known as Mars Hill Church don't thank a Warren Throckmorton or a Wenatchee The Hatchet. Thank Matt Rogers, since he was one of the guys who had the power and evidently seems to have used that power, to authorize the voluntary dissolution of the corporation. It was hard to argue that after about 8 years of going from The Vine to Mars Hill Eastside to Mars Hill Bellevue that whatever Bellevue Church hopes to be has been in the "core" phase unless by some verbal alchemy "core phase" lasts nearly a decade. Obviously Mars Hill Bellevue didn't transition into the International Paper Building and early claims of the real estate being seized by way of eminent domain turned out to be untrue. Between Rogers and Hurst Bellevue Church has what appears to be an extensive history in the last year of having leaders who misrepresent (whether knowingly or not) basic things that have since come into question. It might be prudent to avoid taking statements from its leadership team at face value ... for a season. It's worth noting that the guy who planted The Vine (if memory serves), Jesse Winkler, has a confession at Repentant Pastor. So in terms of that, for those already familiar with the history of a MH/A29 presence in Bellevue, the irony of Winkler's take these days vs. Rogers' take these days may be instructive. Winkler has written as of this year that the 2007 firing/trial process was wrong and that Paul Petry's heart for Mars Hill was in the right place. 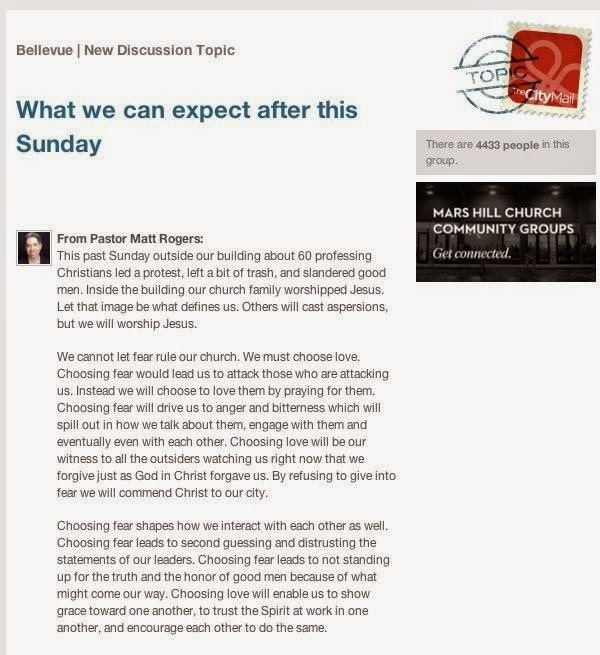 If Matt Rogers wants to stick to his established idea about the protesters from August 2014 he'll be doing so over against the man who founded what has become Mars Hill Bellevue in the last decade and that Rogers may or may not transform into Bellevue Church with success. Back on October 17, 2014 Wenatchee The Hatchet took some time to look not at Mark Driscoll's resignation as such but at what Mark Driscoll's act of vacating the legal office of president for the corporation amidst a financial crisis might entail of the remaining organization. After all, if the president and the secretary both bailed within a short span the way Sutton Turner and Mark Driscoll did and if the finances were spiraling down the drain how might the BoAA be empowered to respond? Any power not reserved for the full council of elders pursuant to Section 6.9 or the board of advisors & accountability pursuant to this Section 7.16 shall be reserved for and be decided by the executive elder team. What seemed to happen in the last couple of months was Mars Hill put four pieces of real estate on the market. Given that the president and secretary of Mars Hill had been no-shows in that season of sale the only way the activity of Mars Hill could be explained within the bylaws on record was that the BoAA might have been exercising some emergency powers. And if the BoAA was authorizing sale of four pieces of real estate then the question of when, rather than if, the BoAA would also authorize was floating in the air. Historically, our mission has always been clear - to make disciples and plant churches. In keeping with that mission you have always been excited about new life and new birth. Last week I shared three values that are the driving goals during this transition period at Mars Hill. This decision must no doubt be difficult but in light of the circumstances was probably one of the only options. This might explain Justin Dean explaining to Throckmorton that Mars Hill did not plan to file for bankruptcy. Why file bankruptcy for the corporation if the plan all along may have been to dissolve the corporation? For those who were never inside Mars Hill it would be difficult, though not impossible, to explain how Mars Hill went from a small church with a an elder-led government system to the megachurch that became a multi-site venue. In ten years Mark Driscoll managed to become pretty much everything he preached against from the pulpit circa 2000-2004. How and why this happened may be explored and unpacked later on. Whether the individual churches that have been constituents of Mars Hill can survive remains to be seen. A number of them may and we'll just have to see. But Mars Hill Global is still a morass of unanswered questions; the report by the BoE regarding Driscoll's sin isn't necessarily published or complete and this will need to be addressed since the more that comes to light the more it seems that Mars Hill leadership is mixed on whether Driscoll is fit for ministry; Mars Hill has still made no statement of apology to those who in the initial wake of Mefferd's plagiarism accusations were passive aggressively made scapegoats over plagiarism that had only Mark Driscoll's name on it; and the fact that Mark Driscoll was allowed to resign his membership from the church rather than deal with Driscoll the way Mars Hill dealt with Andrew Lamb reveals that the Mars Hill leadership culture has a cloud over it, the cloud of double standards and preferential treatment regarding leaders. If Mars Hill no longer exists then the constituent churches that survive the dissolution of the corporation need to be exceptionally wary about the leadership cultures that evolve in the wake of the dissolution. And while Mark Driscoll and Sutton Turner have abandoned Mars Hill they cannot escape their words and actions within Mars Hill as their legacy. Those who have wondered whether Driscoll might head down to California might want to remember that the Orange County eviction involves claims that the executive elders in 2012 (which would have included Driscoll and Turner) KNEW of zoning issues and allegedly played chicken with a city on ordinances. Driscoll might not want to go near California for a while. It's not clear whether Driscoll and Turner will even stay in the state at this point, in the long run. California is probably not a good place of refuge with the 2012 Orange County eviction situation having been broached in public, particularly with claims that the executive elders (i.e. including Driscoll and Turner) knew there were ordinance issues but were claimed to be willing to play chicken over eviction. But Driscoll's appearance at a Texas conference ... well ... maybe Driscoll might move east. But, of course, no one knows what the future holds. Still, after the OC eviction debacle and the unanswered questions it seems imprudent for Driscoll to get near OC. From the Guardian (a reprint, actually) "we need to talk about TED" Not the most warm and fuzzy take on TED talks but it was an interesting read. Even older but somewhat thematically related, a piece from Wired called "When it comes to security we're back to feudalism", a piece about how the feudal lords of our age are information gateway companies whose conduct and methodologies we don't really understand and don't have much impact on. From JazzWax, a blog WtH only recently came across, a musing on how even The New Yorker is guilty of what is dubbed "jackass culture", in which brazen and provocative attempts at humor put outrageous claims out on the net under the rubric of "satire" without necessarily explaining or giving a complete context for the joke. In this case the musing from a couple of months ago was about how a raft of quotes attributed to but never uttered by Sonny Rollins was in bad taste. Simply put, passing information along as fact under the assumption that everyone will know it's a joke is poor editorial judgment. But in the new jackass culture, anything goes, and if you feel offended, well, you clearly can't take a joke (I was on the receiving end of a few of these today). There's a Jewish proverb about how someone is like a man throwing lit firebrands and death about who deceives his neighbor and then when challenged says "I was joking". There's a point at which the context of a conversartion or a venue is better served by seriousness. If even The New Yorker took a stab at effrontery then, well, maybe we "do" live in a Pussified Nation where everyone has dreams of being a William Wallace II, even people writing for The New Yorker. Well, if so, that's our collective loss. And, just because we're already on a jazz themed linkathon, Do the Math features Ethan Iverson writing some fun stuff about Teachout's biography on Duke Ellington and some curious reactions to it; a fascinating discourse on appropriation and mutation within classical and jazz contexts (Ellington and Stravinsky); and some more about Stravinsky's brilliance by way of emotional ambivalence within his music a brutal quote attributed to Stravinsky about Mahler. Ow. Seeing as I can't quite stand Mahler (but respect his influence) I'm not entirely against Stravinsky on Mahler. But Stravinsky could frequently be, to put it delicately, a jerk. Jazz appropriations work best when they are almost totally sublimated, as in Gould’s Symphony of Spirituals. Literal appropriations are problematic. When walking bass shows up in Gunther Schuller’s Seven Studies on Themes for Paul Klee, it mars an otherwise excellent work. I see Shaw’s Partita and "Improvisation" in exactly the same light: one is vital, the other is flat. Steve Reich always talks about Kenny Clarke, but he never tried to make some classical percussionist play a swing beat on a ride cymbal. Instead Reich wrote his own rhythms that have become venacular for modern chamber ensembles. I predict that the path for appropriations of rock and electronica by classical composers will be similar. As always, an echo of folkloric music will inspire new transfigurations from those most inspired by full notation. It’s already happening but the best is surely in the future. One of my most unshakeable objections to a lot of what has been passed off as crossover on the pop/classical divide has something to do with what Iverson describes as connection to the folklore. But being the kind of composer/classical guitarist that I am I guess I would say that the failures tend to be of a kind you can bracket in two distinct ways depending on which side of the pop/classical divide you're on. Pop musicians who try to go classical may demonstrate (rather than discover!) that their musical vocabulary is simply not very well suited to the forms of thought that are common in concert musical forms. Here we get varying degrees of success from pop musicians and jazz musicians in tackling oratorios or instrumental suites. On the other hand, classical sorts have the forms often in hand but tend to fail to make a convincing case that the vocabulary of more popular styles is a natural and convincing language they normally use. The appropriation and affectation is too overt because the musical vocabulary isn't assimilated so much as appropriated. So what about the cases where we have a Gershwin or an Ellington or maybe some moments from Ravel or Stravinsky? Well, I'll hazard a guess, however much the crossover ultimately failed, if we're hearing a case where there is at least a rough match of the vocabulary and the form we'll be okay with what we hear. Sure, Gershwin's jazz vocabulary by itself might not have been convincing and sure his handling of concert forms may be lacking but there's a delicate but for the most part absolutely persuasive balance between the vocabulary and the formal mastery that works. It works for Gershwin's music and it works for Ellington's music, certainly in the works they have done that have become classics. Stravinsky found that magical balance of vocabulary and form in Rite of Spring and Petrushka. There will continue to be crossover but perhaps I'm not the only one who thinks that the end point for these various types of crossovers could be an eventual synthesis. I've heard it suggested over the years that maybe in a way a sonata is like a pop song. There's a way to understand that verse-chorus-verse-chorus-bridge-verse-chorus can be understood as an exposition where there is theme 1, a transition, theme 2, and you repeat the exposition and follow it up with a development before getting to the recapitulation. There is a sense when that charts out as though the two seemingly contrasting forms of a strophic form song and a sonata allegro form could be the same kind of thing. See, I can chart it out in a way that would make it seems as though something by Ellington and something by Haydn are basically the same overall form. But there's no way you could listen to "Dusk" and the Fifths string quartet and imagine that the Ellington ballad and the first movement of Haydn's Op. 76, 2: movement 1 are really the same form are present easily comparable musical experiences. It doesn't just so happen I've gone through most of my life adoring the music of Haydn and Ellington. And I love counterpoint whether it's counterpoint from Bach or, as I wrote years ago, "Counterpoint According to Stevie Wonder". Sure, Bach and Wonder are operating in drastically different musical worlds but they're both true to their respective musical languages and they both display a mastery of the forms and vocabularies they developed. When Wonder uses a simple modal mutation in "Where Were You When I Needed You (Last Winter" (which I blogged about over here) it's an idea so banal in its simplicity it shouldn't work, but Stevie Wonder makes it incredible. Not too surprisingly to me someone else who could take an idea, subject it to modal mutation and transform happy to sad or sad to happy would be someone like Beethoven, or Haydn, or Brahms ... you probably get the general idea. But it may have taken a whole century of fragmentation and mutation for musicians in various streams of performing traditions to also have opportunities to play with how these seemingly divergent and contrasting styles may not be entirely separate. I played with how a Christian quoting Galatians could make a case that in Christ there is no slave or free, Jew or Greek, male or female and that this could be a theological underpinning for the proposal that in Christ there is no high or low, no mainstream or indie, no pop or classical. It's not to say that these distinctions don't actually exist or that those differences never matter but that as a theological proposal a Christian believes that Christ reconciles all things to Himself and that in that sense what so many have considered irreconcilable styles of music that represent cultural norms and values that have no common ground, that may be our hang-up and the apostle Paul wrote millennia ago to warn the Galatians that that set of expectations and boundaries that were believed to be hard and fast have not only become more permeable with the advent of Christ, those boundaries are destroyed by the blood of Christ on the cross and reconciliation is possible through the resurrection. And, of course, not everyone is going to go along with that. But I mention this not merely in passing because in his biography about Ellington Teachout noted that Duke was, in his way, serious about religion and Christianity. Ellington said and did a lot of stuff that might make people disbelieve the reality and sincerity of his Christian profession ... but as regular readers of Wenatchee The Hatchet may nave noted, I've had some pretty stern things to say about problems with the sayings and actions of Mark Driscoll and leaders at Mars Hill without presuming to question the sincerity of their Christian professions. And perhaps that gets us to another little moment. Over at Wedgewords, Steven Wedgeword sums up a transition I've found in my own life. As I never tire of saying, “Ideas don’t have consequences. People with ideas do.” And those people often act upon a variety of more or less consistent motivations and impulses, some rational and some visceral. Pretending that this isn’t the case and that we can solve societal problems with ideas is the surest way to never find a solution to any particular problem. We can’t let worldview, whether religious or political, become a new opium for the people. There could be more that could be written, since as someone once put it of the writing of books there is no end, but this might suffice for a night. There's another MH/MD related blogging project incubating but it will take some time. There are a couple of bits for posterity that seem worth discussing but it won't be a small task.